Spring has finally arrived ushering in warmer weather and a desire for fresh new beginnings. You’ve probably already begun spring cleaning in your home, but what can you do to give your garage a fresh, new feel, too? Let’s look at five simple ways you can be more mindful of the environment as you prepare for spring. Just like your home, your car needs a little attention after a long, hard winter. Keep your car tuned up and use the grade of oil recommended by the manufacturer to improve gas mileage. Another, simple way to increase gas mileage is by keeping tires inflated to the optimal pressure. Check the inside of your driver’s side door jamb to see the tire pressure recommended by the manufacturer. Recycling prevents reusable resources from ending up in overflowing landfills. It also saves energy and reduces the consumption of raw materials in manufacturing. The convenient Blue Box recycling program in most communities makes it easy for everyone to contribute to cleaning up the environment. Make recycling even easier by creating a recycling station in your home or garage. Ensure that everyone in your home understands the importance of recycling, what items should be placed in the Blue Box and how to prep items before discarding them. As you go through your home and garage during spring cleaning, you’ll probably discover items that you no longer use. Some of those items can be repurposed. For instance, an old, unused kitchen table might make a good craft or workshop table. Old muffin tins in the kitchen could make a great place to store nuts and bolts in the garage. Other items have lost their usefulness in your home, but would be welcomed in someone else’s. Consider donating items that are in good condition, but just don’t fit your family’s needs anymore. Conservation is critical to the environment. One of our most important assets is potable water. Review your family’s water usage and look for ways to cut back. For instance, can you reduce the frequency with which you wash the car? If you wash the car at home, don’t use the hose while washing your car. Instead, use a bucket of soapy water. This switch alone can save hundreds of litres of water each wash.
Water your lawn early or late in the day, rather than when the sun is highest, to avoid water waste through evaporation. Also avoid watering the lawn on a windy day. Deep water your lawn. This helps to establish a deeper root system and will allow moisture to reach the roots, where it’s most needed. Water your lawn only when it is needed. Skip watering on weeks when there is a good, hard rain. Another option is to install a rain barrel and reuse rainwater to water your lawn and wash your car. A discussion about environmentally-conscious lawn care wouldn’t be complete without examining your lawn mower. Gas and electric lawn mowers require energy consumption. Your lawn, and the environment, can benefit from less frequent mowing. So only mow the grass when necessary. When you do cut your lawn, don’t cut it too low. A height of six to eight centimeters will help retain water and establish a deeper root system. If you’re in the market for a new lawn mower, electric lawn mowers are more environmentally-friendly than their gas-powered counterparts. 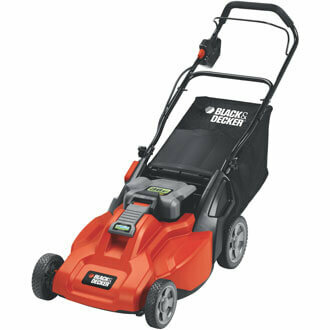 Electric lawn mowers are cleaner and quieter. They are less polluting to the environment and don’t reek of gasoline. Neither do they require the maintenance necessary with a gas-powered mower. If the thought of navigating with an unwieldy cord in tow makes you hesitant to switch to an electric mower, opt for a battery-powered electric mower instead. In a recent post, we discussed how to properly store chemicals in your garage. Keep chemicals out of the reach of children and small animals. Store them in their proper containers. Make sure all chemicals are properly labeled. When disposing of chemicals, check the label first. Follow the manufacturer’s instructions regarding the proper way to dispose of the chemical. Pouring toxic chemicals down the drain is harmful to the environment and can be corrosive to plumbing. Instead, make use of household hazardous waste drop-off depots in your area. Whenever possible, choose no or low-VOC (volatile organic compound) products to get household jobs done. Many manufacturers offer lines of zero and low-VOC interior and exterior paints, primers, stains, coatings and sealants. These products are often low or non-toxic, making them safer for the environment and for your family. Being mindful of the environment as you prepare for spring and summer is a great start to living greener. However, with Earth Day coming on April 22nd, we wanted to examine ways to make your garage greener, too. Check back later this month for seven ways to make your garage greener.